The "Itaewon Global Village Festival"held each year in October provides the opportunity to experience various foods and cultures from all over the world. This festival is held in Itaewon every year as the area has long attracted more foreigners than any other places in Seoul. We invite you to Itaewon, the "small global village in Seoul", where many races and cultures in different parts of the world such as Asia, Europe, America and Africa coexist. Directions(World Food Street) : 3 min. walk from Itaewon Station, Exit 1. ※ Directions to Usadan-gil : 10 min. walk from Itaewon Station Exit 3. This festival held in October each year provides the chance to experience the traditional cultures from all around the world including Korean culture. You can taste the traditional foods of various countries, watch a massive parade and a special music concert, engage in cultural exchange programs and enjoy many other fun events. Gyeongnidan-gil is a few minute walk from Noksapyeong Station (subway) Exit 2 in the direction of NamsanTunnel 3. This is one of the up-and-coming streets in Itaewon. Small restaurants, cafes and pubs can be found lined up on each alley on the walk along Gyeongnidan-gil. The unique side-street stores here have emerged as the hot places preferred by the young people for their simple yet exotic characteristics. 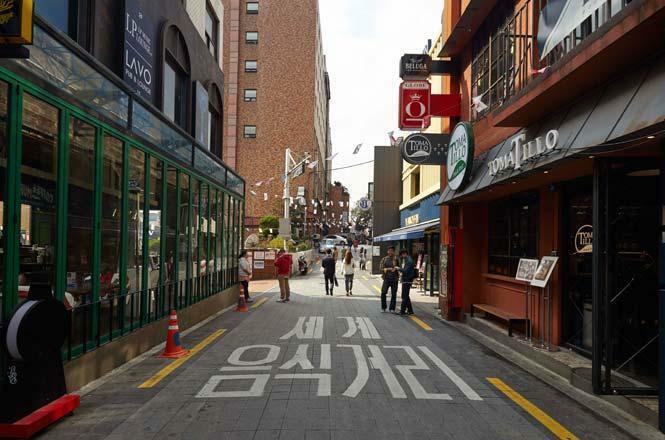 The most popular alleys of Gyeongnidan-gil are "Jang Jinwoo Street" and the "Craft Beer Alley". Jang Jinwoo, a photographer and cook, runs a steak house, an octopus restaurant and several small cafes in the narrow alley. This alley filled with his stores is now called the "Jang Jinwoo Street". "Jang Jinwoo Street" is crowded with a lot of people each night. You may have to bear eating and drinking so close with your shoulders almost touching the people sitting at the next table because these places are very small. But the facial expressions of the people seem far from unpleasant. In fact, they strike up a conversation and even become friends. Such a friendly atmosphere is the reason why so many people come to this alley. The "Craft Beer Alley"is the first to introduce European-style craft beer in Korea. Four young men from America opened a craft beer joint called "Magpie Brewing". Although it started out in a shabby place without even a store sign, it became popular among the young people for its excellent beer taste. Craft beer joints such as "The Booth" and "Craftworks"continued to open, making this alley become widely known as the "Craft Beer Alley". Craft beer joints on Gyeongnidan-gil were opened mostly by foreigners in the beginning. "The Booth" run by Daniel Tudor is especially one of the popular places while Mr. Tudor who used to be a journalist for UK-based weekly The Economist drew attention by releasing an article stating that Korean beer does not taste too good. Shops with an exotic atmosphere are lined up along the low hill located on the other side of Gyeongnidan-gil which can be crossed using the underground passage. As you walk along this road, you will come across "Haebangchon". Haebangchon has been named after the meaning of a "village formed after liberation". It was only recently that Haebangchon began to attract attention again. Exotic shops came into being as many people continued to visit Gyeongnidan-gil, close from this area. American-style homemade hamburger stores, European restaurants, and pubs and cafes with a terrace and a Western atmosphere can now be easily found lined up along the sloping road of Haebangchon. A significant number of shop owners in Haebangchon are foreigners from the US and Europe. Many of them fell in love with Seoul’s old landscape found in Haebangchon during their trip to Korea. They say that they were attracted to the sight of "Daldongne"(old residential towns in uphill areas) where old and shabby houses stand close together, which exuded Korea’s unique atmosphere of simplicity and humbleness. You also don’t want to miss "HBC Art Village" and the "HBC Music Festival" when you visit Haebangchon where the old landscape of Seoul blends harmoniously with the exotic Western culture. It is a must visit for those visiting Itaewon. Haebangchon has transformed into an art village decorated with some 30 murals and structures through the government’s residential environment improvement project. The HBC Music Festival is held twice every year in May and October. Foreign musicians residing in Korea perform with Korean indie musicians at pubs located in the Haebangchon area. The "Antique Furniture Street" displaying antique European furniture can be found on the street close to Itaewon Station (subway) Exit 4. The "Antique Furniture Street"was formed in the 1960s when American soldiers stationed in the Yongsan Base sold off their furniture before returning to the States. It was hard to find Western furniture in Korea back then. The furniture street came into being naturally as shops selling furniture abandoned by American soldiers appeared one after another. As the years went on, furniture of American soldiers became a common thing as Korea achieved a remarkable economic development. So the shopkeepers of the furniture street started to import and sell expensive European furniture to affluent customers. Since the beginning of the 2000s, they have expanded their business portfolios, selling European antique furniture and interior pieces. There are currently around 90 furniture stores on the Antique Furniture Street. Most of these stores sell antique furniture and interior pieces brought in personally from Europe. They have captured the hearts of furniture lovers and collectors because they carry products hard to find at other shops and pieces which have a long history of their own. You can spot old furniture displayed along the streets and people taking pictures of it as you walk along the Antique Furniture Street on a sunny day. It is a flea market held each year in October on the Itaewon Antique Furniture Street. Various vintage and antique furniture and interior pieces are sold at a reduced price. An unfamiliar sight can be spotted when you climb up the hills located behind the Itaewon Fire Station. Shops such as Halal restaurants with store signs written in both Korean and English giving off the pungent smell of spices, butcher shops selling muttons which are hard to find in Korea, and general stores displaying chador (traditional garment worn by Muslim or Hindu women) and hijab (veil/headscarf worn by Muslim women) are lined up along the street. The official name of this street is Usadan-ro 10-gil Road but people usually call it the "Islamic Street" or "Usadan-gil". The Seoul Central Mosque is located at the center of Usadan-gil. The towering twin minarets and the round masjid (mosque) welcome visitors after passing the entrance which reminds of castle gates of the Middle Ages. The Seoul Central Mosque, which completed construction in 1976, was the first Islamic mosque in Korea. The Seoul Central Mosque is open to both Muslims and visitors. However, Sharia, the Islamic Law, forbids wearing short-sleeved tops, short skirts and pants,so sometimes Islamic clothing provided by the mosque must be worn to enter. Koreans as well as tourists from all over the world come to visit the Seoul Central Mosque on weekends. Although experiencing Islamic culture in the Asian country may feel unfamiliar, it will offer an unexpected moment of pleasure. The Islamic Street started to develop on Usadan-gil from 1993. Most of the laborers from the third-world regions such as the Middle East, Southwest Asia, Southeast Asia, India and Africa were Muslims and they lived around the Seoul Central Masjid. As the number of Muslim residents grew, convenient facilities for Muslims such as Halal restaurants, Islamic prayer product shops and general stores appeared naturally, forming the "Islamic Street". Usadan-gil is an old neighborhood composed of narrow, complicated alleys, steep stairways, old and rusty slate-roofed houses. Due to cheap rents, many Muslims chose to live here. Usadan-gil has emerged as the new hot place of Itaewon as young artists and small shopkeepers flocked in here in the last few years. Small workshops, handicraft shops, pubs, cafes and restaurants will catch your attention as you walk pass the Seoul Central Masjid. The young people have chosen to open stores on Usadan-gil because the rents are generally cheaper than in other places. These shopkeepers have fallen deep into the charms of Usadan-gil which harmoniously blends Seoul's old landscape with the unique Islamic culture. The Usadan-gil youth community "Usadandan (Usadan Society)" has promoted Usadan-gil through various activities such as the Stairway Flea Market and the Dong Dong Tour (a tour of all corners of the Usadan area filled with interesting stories which is named after the host Lee Young Dong), and a great number of people visit this neighborhood every weekend. This flea market is held on the last Saturday of each month on the stairways located behind the Seoul Central Masjid. Various products including handicrafts and food are sold at the flea market. The Dong Dong Tour is a Usadan-gil tour program. The tour is carried out for people with advance reservations for the Stairway Flea Market visit. The "World Food Street" located on the back of Hamilton Hotel features cuisines from more than 30 countries around the world such as those in Asia, America and Europe. This street is currently the most popular area in Itaewon because there are many shops which allow you to enjoy cuisines of foreign countries hard to experience without going on an overseas trip. Come and visit the World Food Street in Itaewon and experience the taste of the world! Opened in 1984, the Pakistani restaurant Moghul is the oldest restaurant on the World Food Street. Traditional Indian dishes were hard to find in Korea when Moghul was opened. It is one of the first-generation Pakistani restaurants in Korea. All staff members of Moghul including the head chef, cooks, managers and waiters are native Pakistanis. Moghul’s most popular dishes include the Pakistani style curry and the Pakistani BBQ which can also be enjoyed in Mogul’s cozy outdoor garden. "Copacabana" is a seaside city located in Rio de Janeiro, Brazil. As the name suggests, Copacabana Grill is a Brazilian BBQ restaurant. The owner, cooks and waiters are all native Brazilians. The Copacabana Grill is famous for its Brazilian traditional BBQ "Churrasco" which allows you to enjoy the best taste and flavor by slicing the grilled meat onto your plates right at the table. It is the perfect place to satisfy the appetite of tourists with its unlimited meat offer. Churrasco is a term that refersto various parts of meat including beef, pork and chicken grilled on rotating skewers which is sliced and served at the table. Churrasco originates from shepherds of southern Brazil who ate meat grilled on skewers long time ago. Zelen is a restaurant owned and run by young Bulgarian cook Mihal Ashminov and his brother. It is the only Bulgarian restaurant in Asia. Mihal who appears frequently on Korean television programs introducing famous restaurants opened Zelen in 2007 after working at a hotel in downtown Seoul. "Svinska Kavarma", a stew served with diced pork tenderloin and various vegetables, "Trushia" known as the Bulgarian kimchi, and the world-renowned "Bulgarian Yogurt" are delicacies which can be tasted only at Zelen. Trushia is a traditional Bulgarian salted pickle consisting of mixed vegetables such as cabbage, tomato, cucumber and broccoli. Bulgaria has the tradition of making Trushia in the summer and eating them in the winter when fresh vegetables are hard to find. Gecko’s Avenue is in the vanguard of introducing European cuisine to Korea and the starting place of the European restaurant boom. Gecko’s Avenue, which has remained in the same exact location since its opening underthe name of Gecko’s Garden 14 years ago, has emergedas a complex cultural space offering a stylish interior with a spacious and pleasant garden. The "Mediterranean Paella" which has seafood, chicken and the pleasant hint of saffron mixed altogether and the "Seafood Salad" topped with raspberries are some of the popular dishes among women while simple alcoholic beverages and European-style eatables such as foie gras can also be enjoyed at the lounge bar.